We all want to be valued, to be respected. To be loved. 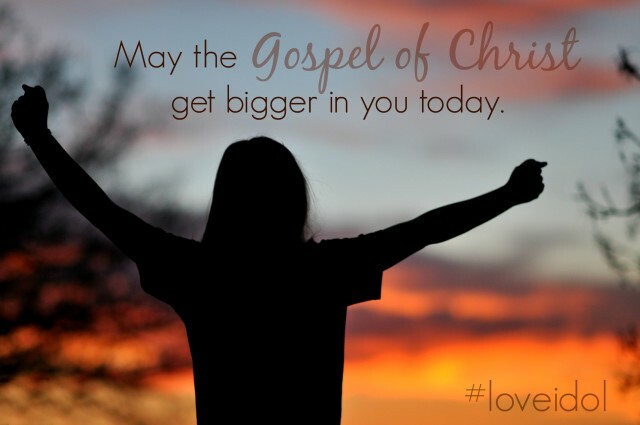 Yet this yearning too often turns into an idol of one of God’s most precious gifts: love itself. If you, like so many of us, spend your time and energy trying to earn someone’s approval—at work, home, and church—all the while fearing that, at any moment, the facade will drop and everyone will see your hidden mess . . . then love may have become an idol in your life. 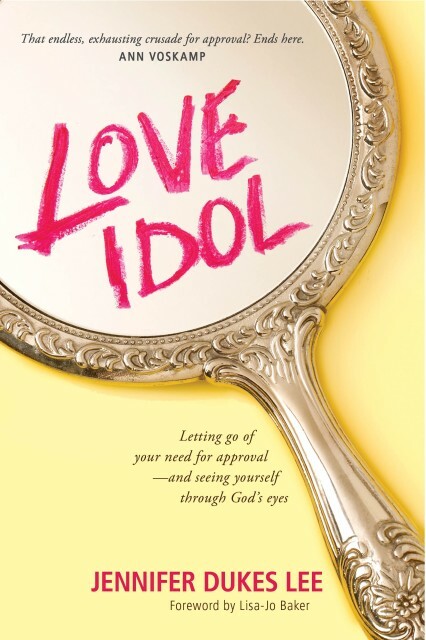 Love Idol will help you dismantle what’s separating you from true connection with God and rediscover the astonishing freedom of a life lived in authentic love. If you want to book Jennifer for a speaking event, start here, at her speaking page. Jennifer is sharing the message of “Living PreApproved” at women’s retreats, churches, conferences, and college campuses across the U.S. in 2015. If you have a media inquiry, email maggierowe@tyndale.com. 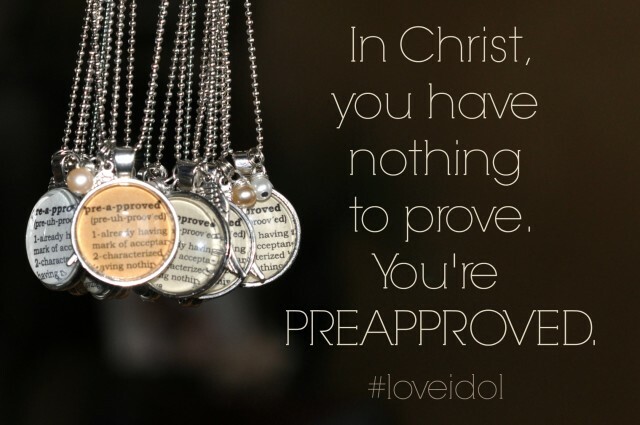 In Christ, you have nothing to prove. 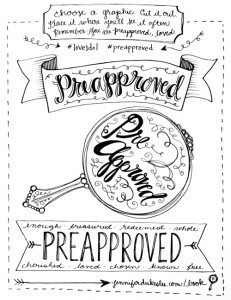 You’re already approved. 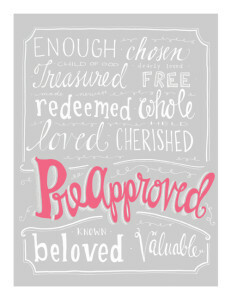 For more info about our printables and the Love Idol Movement, click here. Love Idol is a book that is going to set a lot of women free. It’s a journey of grace, truth, and beautiful freedom. Jennifer Dukes Lee takes her readers by the hand and leads us to the home our hearts all long for deep inside—a place of true acceptance. I am so excited about the book you hold in your hands! You are about to embark on a journey of soul healing and emotional freedom. I love how Jennifer poetically crafts each sentence; I love her transparent heart for us, her readers; and best of all, I love the way she communicates the love of our Savior. 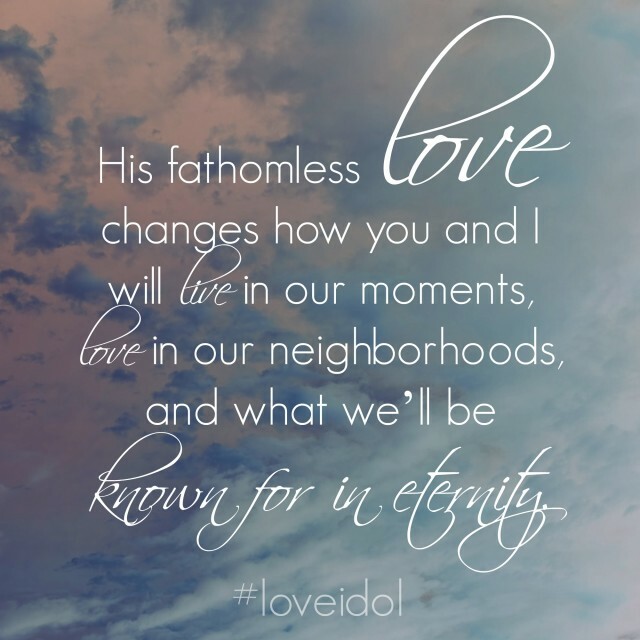 Love Idol invites you on a journey that will change you from the inside out. Jesus has set His heart on you, and you’re worth everything to Him. Today is a brand-new day to believe it, receive it, and walk in that treasured freedom. There is no fluff in this book. It is solid, biblically based, and very readable. Within the pages of Jennifer’s words flows a gentle persuasion that whispers to our souls: you are loved, you are approved, you are my beloved. It is a message of hope that, if taken to heart, could free you from the tiring job of trying to be perfect. This book will encourage you and help you exchange your love idols for performance-free living. I read Love Idol slowly because I didn’t want it to end. When I turned the final page, I closed the book and hugged it to my heart. I don’t think I’ve ever read a book quite like this one. It is elegantly written, beautifully spoken, bravely crafted, and tenderly shared. 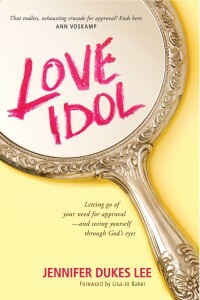 Love Idol is a sparkling love letter from the God who rejoices over each one of us—exactly as we are. Has Jennifer Lee been reading my journals? In all seriousness, Love Idol taps into something countless women struggle with. 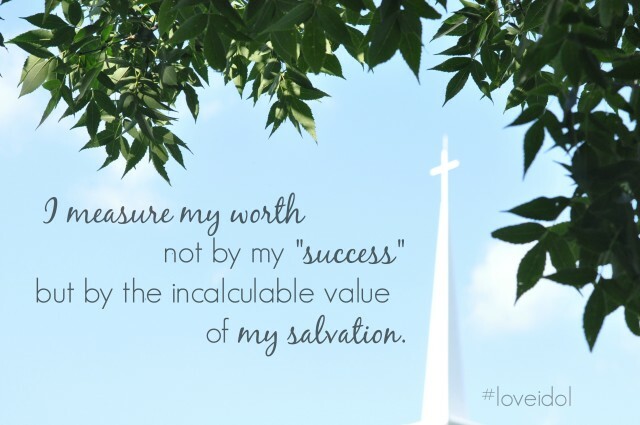 As I read Jennifer’s tale of pursuing accolades and accomplishments instead of resting in God’s absolute love for her, I was reminded of my own futile attempts to impress people—and God—with my achievements. I’ve been a fan of Jennifer for a long time, and I’m an even bigger one now. 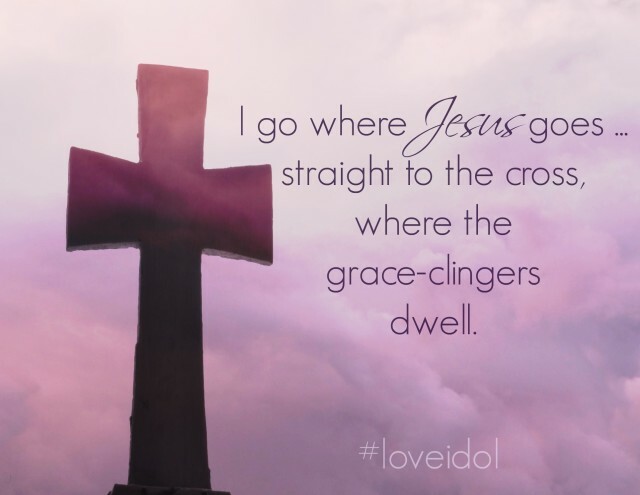 Love Idol’s gorgeously crafted, warm writing style and deeply honest stories invite readers into Jennifer’s world, while simultaneously pointing them toward their heavenly Father. This is a book I’ll keep close at hand and recommend to many, many women. Jennifer Dukes Lee has written a book that every woman needs to read, a book that speaks counterculturally, a book that whispers to the heart of every mother, daughter, wife, and sister who longs to find approval. Through simple prose and personal anecdotes, Jennifer reassures us that we were born preapproved. We don’t have to keep striving for love because we were designed and created by Love itself. It is with great joy and conviction that I endorse this timely and poignant work. Jennifer Dukes Lee’s book is beautiful and honest. As I read her stories, mesmerized, I realize that all too often I can spot my own heart in the stories and on the pages of Love Idol, recognizing how I’ve caved to the world’s expectations and craved approval and significance, turning away from my first Love: Jesus, the only One whose approval truly matters. 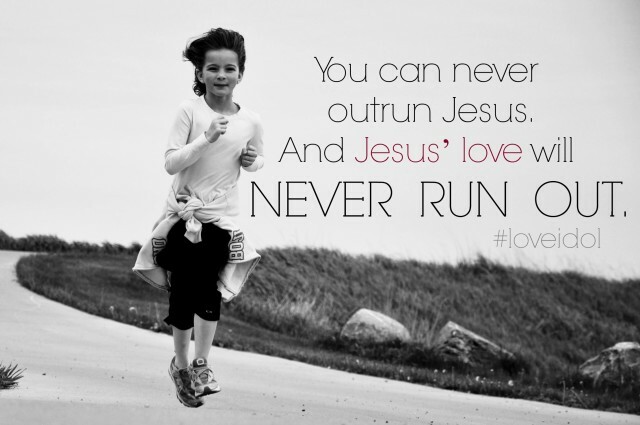 Love Idol reminds us to turn back to Him, where we find we’re already approved. Jennifer’s writing is so real, so honest, so vulnerable, so powerful. As Jennifer bares her heart, she challenges each one of us to examine our own, teaching us how to dethrone the Love Idol and experience the life-transforming love of Jesus for ourselves.